Manual bottling plants are a great way to save money and ensure there is plenty of clean drinking water on site. Aquamat offer bottling plants which are compact and efficient, and are capable of offering 3000ltr/hr of bottled water. The bottling plants can also be adapted to incorporate reverse osmosis, remineralisation, sparkling or flavoured water. Aquamat XCM132A 130l/min Feed Pump with Float Switch. 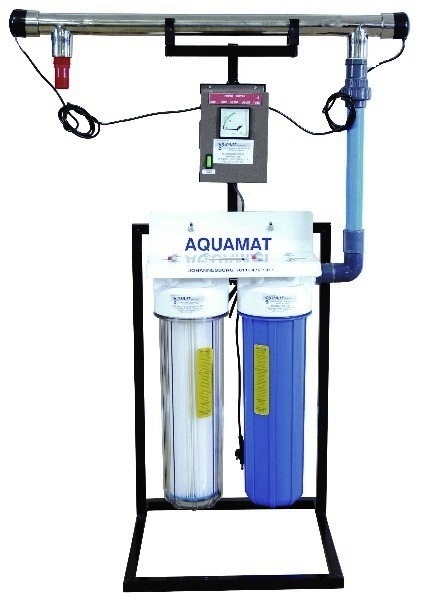 Aquamat Triple 20’’ Big Blue Filter Bank. Aquamat 5g Integrated Ozone Generator. Aquamat XCM60 Ozone Circulation Pump with Venturi. 300 litre Square Stainless Steel Ozone Mixing Tank with lid. Aluminium Checker plate Steel Frame. 2 Stainless Steel Drip Trays. 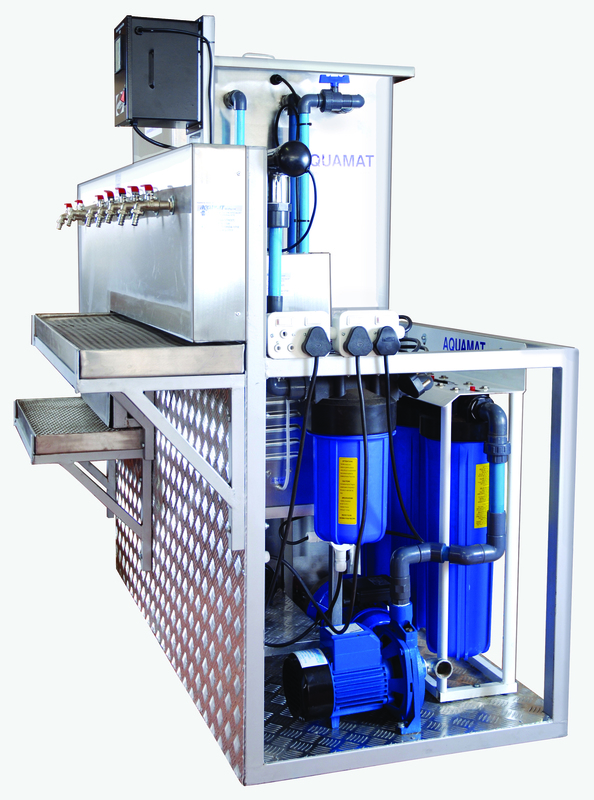 This versatile unit can be adapted to incorporate reverse osmosis, remineralisation, sparkling or flavoured water. A compact filtration and ultra violet sterilisation unit for small bottling operations where final polishing and sterilisation is required. Takes up a small space. This unit has all the benefits of the 20 inch BB Double Combo and UV plus an additional 5 micron sediment cartridge for even finer filtration. A compact filtration and ultra violet sterilisation unit, providing longer contact, slower filtration and better taste, odour and chlorine removal time, where final polishing of water is required. Ideal for entrepreneurs to start a small water bottling operation. It is compact, takes up small space, easy to operate and cost saving. This unit has all the benefits of the 10 inch Double Combo, plus an additional 5 micron sediment cartridge for finer filtration.